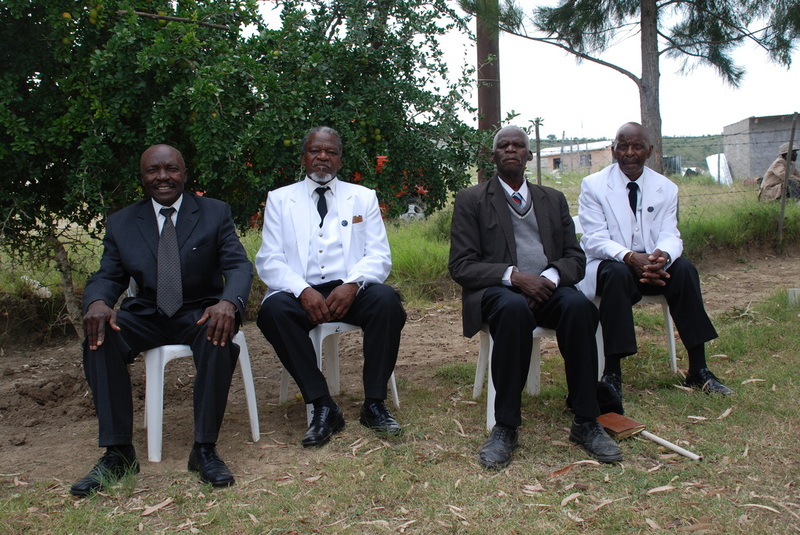 The Elders [men] of the church wore their Sunday best: black pants with white shirts and white jackets, black ties and dress shoes. The women who belonged to the Women’s Association were in black skirts, white long-sleeved blouses and black hats. Many people walked for kilometers over the dusty, rutted, so-called roads to get to the church in Macfarlan; many hitchhiked. A very few drove cars or bakkies (small white trucks with enclosed backs containing a bench on each side crammed with people). Reverend Luzuko Qina escorted us down the center aisle to our seats on the left side of the altar where the choir and elders sat. It was a place of honor for the guests from America. Even before we entered the church, it was literally pulsing with singing and swaying. Hands tapping on bibles kept the rhythm. It was an amazing scene to behold from our exalted seats. 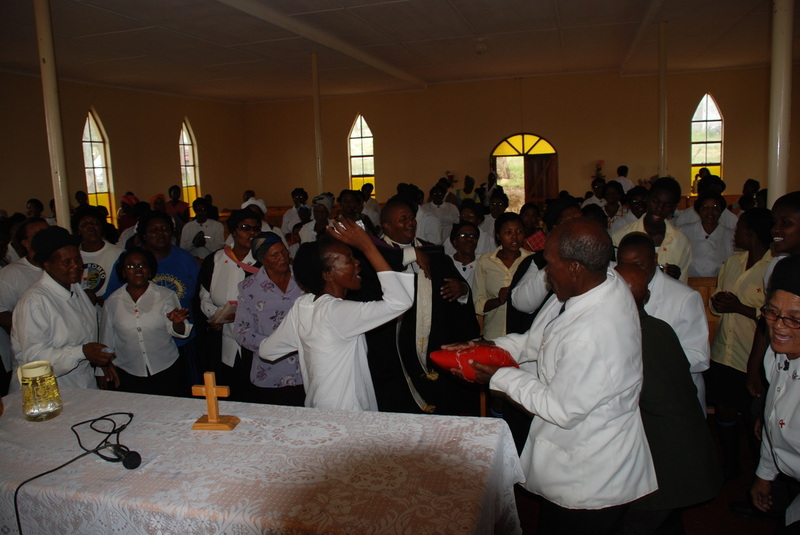 We looked out over a bright yellow nave almost full of Xhosa people in their black and white Sunday clothes. The people of the congregation were dressed in colorful clothes; the women wore headscarves tied into brightly colored Tastee-Freez confections. It was a most marvelous sight! This was going to be a very special service. It would be the first time in this glorious, lush valley that the issue of HIV/AIDS was to be addressed in a church setting. 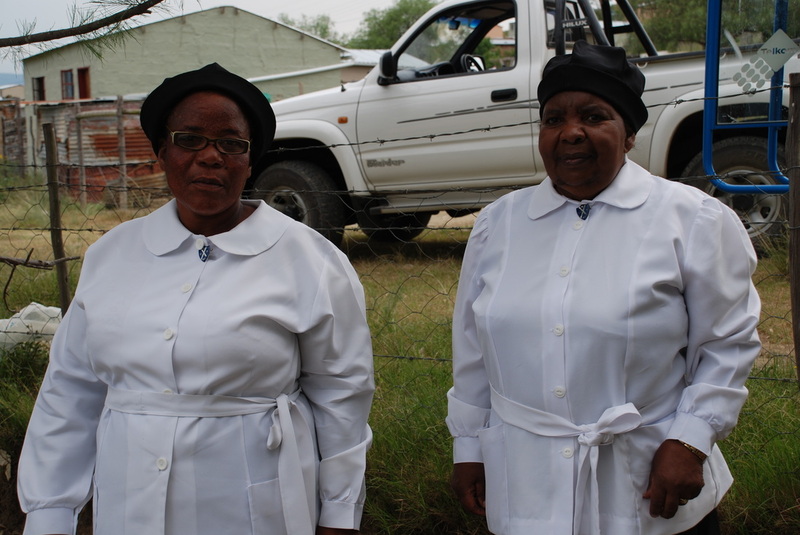 Together with the minister, a retired nursing sister, Eugenia Gugwini - herself a church member - organized the proceedings. 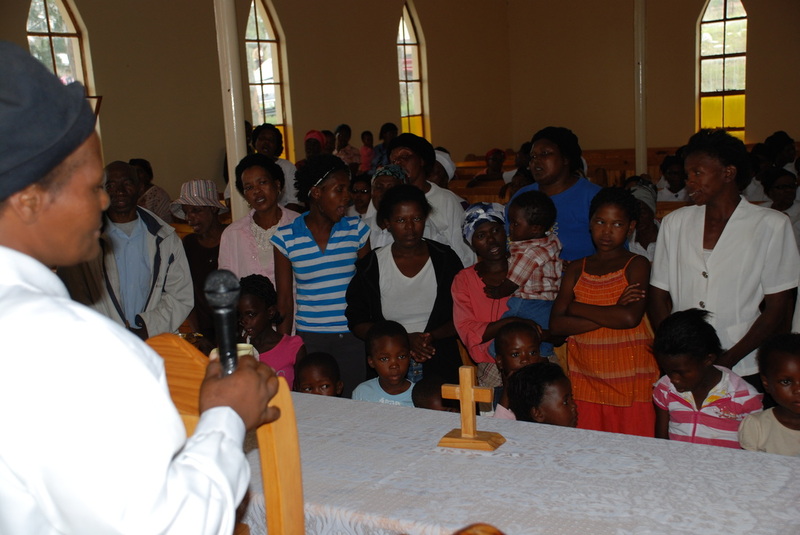 Sister Gugwini spoke strongly about the curse of HIV/AIDS. She had also arranged for a woman from the government’s Dept. of Social Services to speak. This woman was a dynamo! She spoke loud and clear in strongly animated words jumping from Xhosa to English without stopping for a breath. EVERYONE got her points. 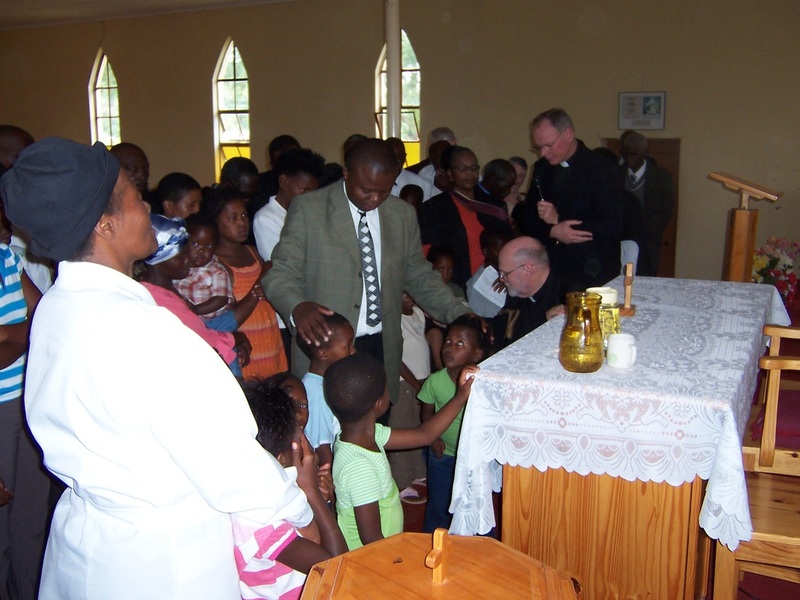 After she finished, Sister Gugwini invited all the people with HIV/AIDS, including about two dozen AIDS orphans, to come to the front of the church. Along with the Elders, Women’s Association and the choir, we were asked to come down and surround these people with our love. It was a very moving experience for us, and, I believe, for everyone assembled. 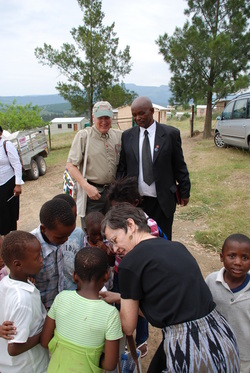 Our two American ministers and Vusi Mpokeli - head of Heifer International's office in this province - prayed over the people. Tears began to fall. Singing, swaying and wailing soon started. Something very unusual happened as this swaying and enveloping was taking place. A group of about a dozen men, who were also on the altar level but basically banished to the two back rows like lepers, stood up. These were men with HIV/AIDS. [PLAY THE VIDEO TO THE RIGHT - YOU WILL SEE THE MEN AS THE CAMERA SWEEPS LEFT]. Ordinarily, the men who have the disease do not show themselves so publicly. All credit for this display goes to Sister Gugwini for getting them to take ownership of their part in spreading the plague which is taking out a generation of people. Most South Africans have been touched by the pandemic in some way. The middle generation is disappearing. Nearly every granny in every village is caring for at least one grandchild. 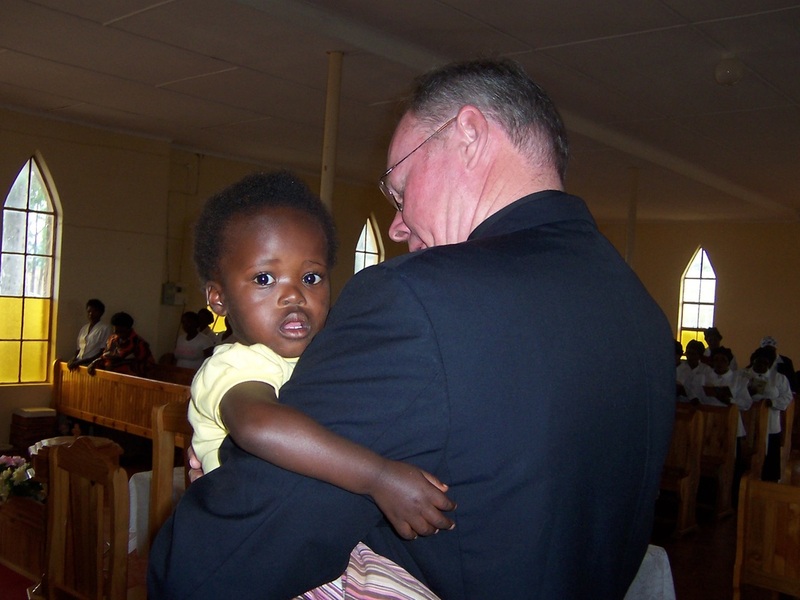 Many of the little ones are ill; most have lost one or both parents. What will happen when the grannies die? Already, some of those small ones are being cared for by an older sibling. That is the present - and future - in South Africa unless some big changes are made. The government of the country has been a big stumbling block in getting medications to the people and in gaining control of this pandemic. Former President Mbeki and his Health Minister espoused the theory that the virus was designed by whites to kill off the blacks! Moreover, they held the same view about the antiretroviral drugs (ARVs) that were brought in to help the diseased population. Their answer to the problem was to recommend traditional herbal treatments and good nutrition. In some places, witch doctors are still widely used. The words of an Assistant Health Director challenging this viewpoint eventually got to President Mbeki, although the woman soon lost her job for causing an affront to the President. Thankfully, this view has changed, and President Mbeki and his Health Minister are now out of power. But the stumbling blocks are now whether the people can afford treatment and if they can get transport to hospitals in big towns and cities, which currently  are the only places to offer the drugs. The situation is still not good but it is heading in the right direction. Everything happens ever so slowly in Africa; Ed calls it “South Africa time”. People die waiting for the wheels of government to turn! “Sobonana!” Good-bye waves and hugs were being given as people trouped out of the oppressively hot church. Everyone seemed truly happy that our small band of Americans had ventured thousands of miles to meet the residents of this lovely valley. These South Africans live in the many small confetti villages that seem as if they were sprinkled by a hand from above onto the lushness of this broad valley nestled in the Amatola Mountains. We hugged the adults, and didn’t want to give the tiniest children back. They were so beautiful with their shining faces grinning up at us. The little ones were innocents and so dearly precious like kids everywhere. They lived in the moment and just wanted to play and be happy. No child deserves less. We thought of what their futures held and the hardships that lay ahead. Our smiles were mixed with tears. We knew we had a lot of work to do to improve the lives of these little victims. We spent the rest of our month in South Africa working daily toward that end. As the month rolled on, it became clear this partnership was changing from being ‘church to church’ to a more ‘community to community’ partnership. Ed is giving William a hug - he's lost all of his daughters to AIDS.